Young and elegant artist Katja Novitskova explains her work that is inspired by technology, media and narratives. 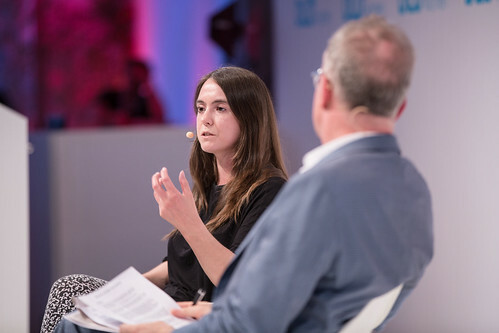 Hans Ulrich Obrist (Serpentine Gallery) introduced Katja by asking her about her work as a curator from before she began her own art practice. The internet served as an inspiration for her first curating community as well as pieces of digital art. “There’s no black and white distinction between art and other forms of mediation,” said the artist. The two art experts continued to discuss different shows of Katja and ideas surrounding her inspirations and where her work was heading.